Does your child need a Personal Child Story? Does your child struggle with behavior concepts? Perhaps numbers or letters are particularly difficult for them? Or maybe you just want your little one to feel extra loved and appreciated? All these are reasons to give Personal Child Stories a call! Personal Child Stories was begun specifically to address all of theses questions. The company owner, writer and designer, Shara Lawrence-Weiss is a journalist, early childhood specialist, experienced nanny and freelance writer who is also experienced in special needs children from a firsthand perspective. She has taken this diverse background and combined her many skills along with a passion for reading into a wonderful positive learning tool for children of all ages. Her books are custom designed for each individual child with pictures, story line and theme centered around each childs particular needs. I had to see this for myself! I recently received some samples of her product and was most impressed! Her books come in two sizes, 5×5 for smaller children and 8.5×9 for older children. Trust me when I say that these books are meant to last! Each page is laminated and the book is spiral bound for easy page turning. The result is a sturdy book that will hold up to drooling, chewing, throwing, stepping on, and just about any other rough treatment your toddler can imagine! The pages will not tear, can be written or colored on and then can be wiped clean again with a damp cloth to look brand new again! 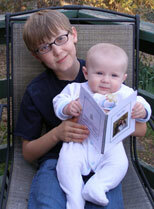 From babies to toddlers to even older children, Personal Child Stories inspire and teach all ages! Storylines are completely customized and used in conjunction with actual submitted photos of the child to fit each childs individual need, situation or desired learning concept. She works closely with parents to accomplish this. 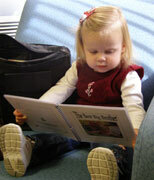 Her alphabet book and counting book samples were a huge hit with my little toddler! She loved flipping through the book again and again, counting the pictures and pointing out the letters of the alphabet!…of course that was after I had exhausted my patience answering numerous requests to “read it again, mommy!”. The counting book was especially neat because it not only had a cute rhyming lilt to it but it also showed the numbers in Spanish, English, and sign language! As a graphic designer of over 12 years experience, I can attest to the life-changing impact that strong images and well written copy can have on people of all ages. Shara has combined both in her product and I would highly recommend these books to anyone looking to teach their children through the power of positive reinforcement.